A variety of kiosks and activities for the best Easter party ever! Invitations, decorations, a coloring book, a new song, a schedule, a printable menu, and many other activities for your Easter celebrations. (Open thematic poster-Easter-A celebration) Print, laminate, and decorate the walls of your daycare with all kinds of posters. 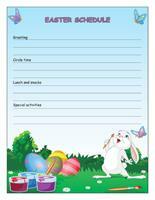 (Open educa-theme-Easter-A celebration) Print and laminate the document. The illustrations can be used to present the theme to children (and their parents) while decorating an area within your daycare. 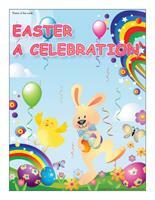 (Open educa-decorate-Easter-A celebration) Print, laminate, and cut out the various items. Use them to decorate your daycare and set the mood for the theme. 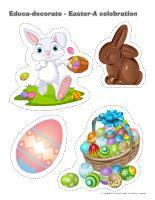 (Open garland-Easter-A celebration) Print the illustrations. Let children decorate them. Cut them out and hang them within your daycare or near your daycare entrance to create a garland. This special tool was created in response to a special request received. (Open picture frame-Easter-A celebration) Print. 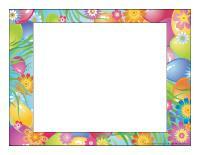 Use the frame to display pictures of your Easter party within your daycare. If you wish, print a frame for each child. They will be happy to take a picture home as a souvenir. We suggest celebrating Easter with the Easter-related games and activities provided in this theme. (Open Easter schedule) Print and laminate. Complete the schedule by listing they day's activities. Display near your daycare entrance. 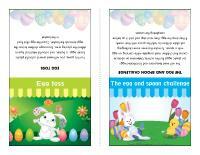 (Open menu-Easter) Print and laminate. Use an erasable marker to display your daily menu. 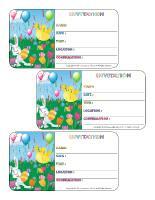 (Open passport-Easter-A celebration) Print a passport for each child. After completing each activity, children can stamp their passport or add a sticker. They must collect enough stamps/stickers to receive the surprise that will be handed out at the end of the Easter party. (Open invitations-Easter-A celebration) Print the color or black and white version of these invitations. If you choose to use the black and white version, encourage children to color their invitation. Drop each child's invitation in his/her cubbyhole to inform parents that you will be hosting an Easter party. Identification card like a necklace. Paint each child's face to represent a bunny or a chick. If you prefer, simply draw Easter eggs on their cheeks. (Open Easter kiosks) Print and display on a wall next to the various kiosks. Here, you will find a wide range of kiosks offering different types of activities. You may pick and choose the ones you feel your group will enjoy the most or create your own. For this game, you will need several colourful plastic Easter eggs, a basket, and colourful electrical tape to delimit the playing area. Encourage children to toss the eggs towards the basket. Count the eggs that land in the basket. You will need teaspoons and hard-boiled eggs (or plastic eggs) for this activity. Determine an obstacle course that children must complete while carrying an egg with a spoon. To make this even more challenging, ask older children to hold the spoon with their mouth. If they drop the egg, they must stop and pick it up before completing the course. Fill plastic eggs with a variety of elements that will produce a sound when children shake them. Fill two eggs with each element to create egg pairs. Encourage children to shake the eggs and try to identify which eggs contain the same element. Divide your group into pairs and determine a start and finish line. Two by two, children must hop to the finish line like a bunny as quickly as possible. 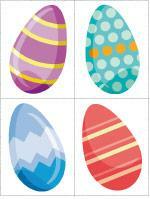 Print and laminate several Easter-themed shapes. Divide your group into pairs and encourage children to lace the shapes as quickly as possible. Who will finish first? Determine a start line. Have children stand behind it and perform a giant bunny hop, jumping as far forward as possible. Use adhesive tape to mark the spot where each child lands. If you wish, use a measuring tape to measure the length of each child's jump. Determine a start and finish line. Each child has a partner. One child from each team will represent the wagon; he/she must rest his/her hands on the floor while his/her partner raises his/her legs (the wagon handles). Rest a carrot on each wagon (on the back of each child). Children must try to reach the finish line without dropping their carrot. You will need brooms, small shovels, or other accessories that can be used as golf clubs as well as colourful plastic eggs. Use colourful electrical tape to draw a path that children must follow, pushing the eggs along with their improvised golf clubs. 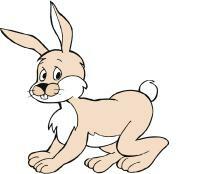 (Open game-The rabbit's tail) Print and display the rabbit on a wall, at children's eye level. Glue a few cotton balls on each rabbit tail. Blindfold children and encourage them to try to glue their rabbit tail as close to the correct spot on the rabbit as possible. Variation: Draw a rabbit holding an empty Easter basket on a large sheet of paper. Invite children to try to stick a construction paper Easter egg as close to the basket as possible with their eyes closed. (Open twister-Easter) Print. Use adhesive paper to stick the large shapes on a 4 ft² playing area. The game leader picks one Easter card and one body part card and uses them to give instructions to the group as in the traditional Twister game. For example, he/she may say, "Place one foot on the rabbit." Variation: With younger children, simply use the illustrations to decorate your daycare or for a recognition activity. If you stick the illustrations on the floor, babies will enjoy crawling from one illustration to the next to admire them. On a large piece of white cardboard, draw a tic-tac-toe grid. (Open Easter tic-tac-toe) The rabbits will replace the X's traditionally used while the chickens will replace the O's. This game is for two children at a time. One child uses the rabbits while the other player uses the chickens. They take turns depositing an illustration in the grid's squares. The first player to arrange three illustrations in a row (up, down, diagonally) wins. Play Easter songs and encourage children to invent their own original duck dance. Take pictures or create a video of their choreography. Print the pictures and display them as a reminder of this fun activity. 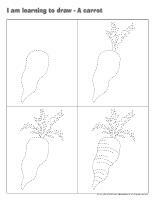 (Open I am learning to draw-A carrot) Print and laminate the model sheet. Encourage children to practice their drawing technique on the model sheet and later try to draw a carrot independently. (Open coloring book-Easter-A celebration) Print for each child.